So, today I decided to take my coffee out. 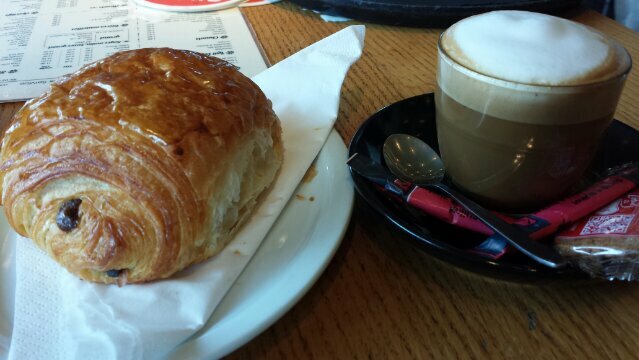 I stopped by the infamous Cafe Belga and enjoyed a lovely cappuccino and chocolate croissant for less than 5€. Pleasantly surprised, in fact. There’s something to be said about Europeans and the French and their breads. You recall that I love Maple Street Patisserie, yes? I just can’t get enough of fresh baked breads, filled or not! The croissant was perfect, gently crispy on the outside, chewy in the middle, with a fine layer of chocolate paste to boot. Perfectly satisfying. I’ll give you an update when I come by again. Perhaps a weekday will make it more amenable to a prolonged stay.